The Buzz: Another Birthday Card?! Hello Friends! Yes! I have another birthday card to share. I am in the process of re-setting my studio...putting away all the Winter stamps and papers and bringing in all of the Spring and Summer stamps and papers. It's an exciting time and I usually don't create much. I enjoy looking at all my old stuff with new eyes. It's so motivating and gets me in the mood to create. But for now...I saved a few cards that I created recently and I will be sharing those with you over the next few days. 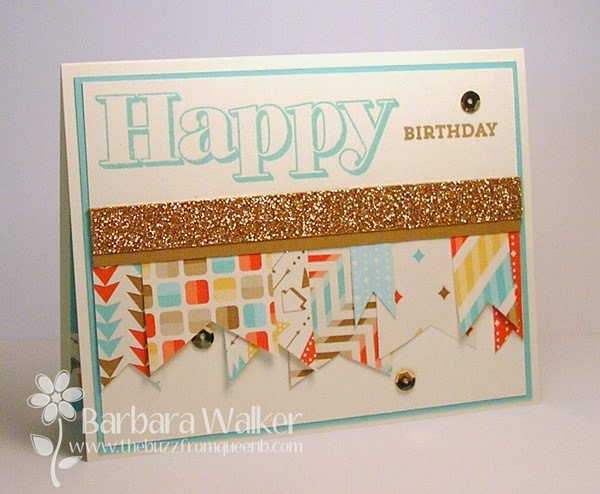 Todays card features all Stampin' Up! products. I made this one at my dear friend, Caryl's Stamp Camp. LOVE those stamp camps...lots of new products and fun techniques shared! The stamp set I used is one of the new photopolymer sets that Stampin' Up! now carries. They have wood mount, cling and now these! 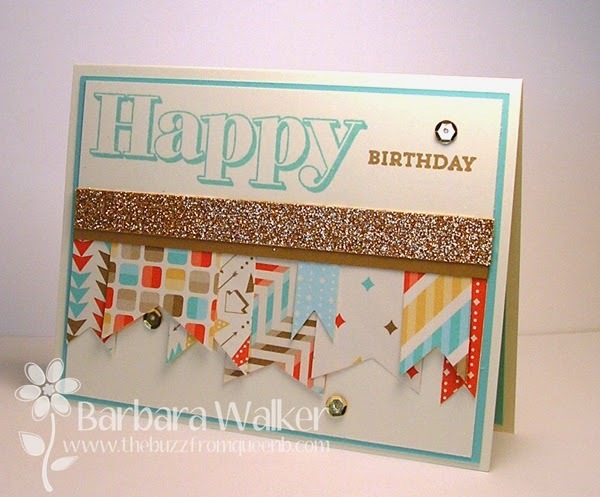 I love the color combo on the patterned paper! I love the patterns, too. The strips were cut at varying widths and then I cut each one into a banner end. I adhered them to a piece of light brown card stock and added the strip of gold glitter card stock on top. I tell ya, that touch of gold...just makes the whole card sing! Gold is so trendy right now and I love it! I added a few gold sequins to pull it all together.